I would like to start by congratulating Phil Reinhardt on becoming the WA representative for the SRA. Phil is a really nice bloke and a good friend of mine, and we have enjoyed many pleasant rides together. I am sure that he is going to do a really great job in his new role. A few weeks ago I posted that we were having a breakfast run out to Dwellingup on the 18th April. I am pleased to report that we had a good turn out despite a number of our regular riders not being able to make it. We had Graham join us for the first time on his VT400. Everyone expressed that they enjoyed the day. I was asked to organise another ride the following weekend for some of the guys could not come the previous week. 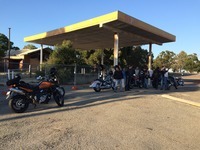 That ride took us out via the back roads to Mundaring, and again we had a good turn out and an enjoyable ride. Our next ride is a longer trip out to Quindanning via Dwellingup and will be held on the 16th of May, weather permitting. As always those who want to can meet at the corner of Tranby Drive and McIver Way Baldivis, just off the Safety Bay turnoff on the Freeway at 8am or at the Serpentine Service station on South Western Hwy at 8.30am. We will stop at North Dandalup for fuel and I would suggest that everyone tops up there to ensure that they don’t run out on route. Yes agree with Radaco. Keep trying guys. After riding through all that Queensland Rain.